It's Advent time again! Our tree is up and decorated and the stockings are hung on the mantel 😊 I love having our Christmas decorations up, especially the handmade ones. For Advent in 2016, I shared each week about the characters in the Christmas story. I wrote about Elizabeth, Joseph, Mary and the shepherds (that one is still my favourite of all the devotions I've written). This year, I want to look at some of the other people in the story. I'll be honest, some of them are only sort of in the story, but whenever I considered what to do for an Advent series these were the ones who came to mind. This week I'm starting with one of those 'sort of' characters - the innkeeper. Now, the innkeeper is never actually mentioned in the bible. Luke 2:7 says, "She gave birth to her firstborn son. She wrapped him snugly in strips of cloth and laid him in a manger, because there was no lodging available for them." That's it. There's no mention specifically of an innkeeper, though the KJV does at least say, "there was no room for them in the inn." We know nothing about the owner of this inn in which there was no room for them. He was probably like all the other innkeepers in Bethlehem, who also would have had no room for this young couple. But even though there was no room for them, he made room. He found a space that he could offer to them and that's one of the things that keep coming to my mind whenever I think of him. What he had to offer wasn't perfect. He didn't have a large space to offer this pregnant woman who was obviously very near the time to deliver her baby. He probably couldn't offer her much in the way of privacy or peace, but he could at least give her shelter. He didn't let what he couldn't offer get in the way of offering what he could. How often do we hesitate to do something because what we can do won't be perfect? We feel like we don't have 'enough' so we don't offer anything at all. And yet, maybe the little we could offer would be exactly enough. The other thing that always comes to mind when I think of the innkeeper is this verse: "Don’t forget to show hospitality to strangers, for some who have done this have entertained angels without realizing it!" (Hebrews 13:2). This innkeeper didn't have a perfect room to offer to this young couple in need, but he gave them what he could and in doing that He played host to the Son of God! Just think about that for a moment. He could have said no when Joseph came looking for a place to stay. He could have ignored that feeling of compassion that prompted him to give them somewhere to rest even though his inn was already full, but instead he said yes. He thought he was saying yes to Joseph and Mary, but really he was saying yes to God. Did he ever realize who he hosted? Did he notice the shepherds when they arrived to see the child the angels told them to find? Did he hear them praising God as they left? Maybe, but maybe not. Maybe we will recognize the moments when God works through us, but maybe not. The important thing is for us to say yes, even in those moments when we think what we have to offer is not enough. 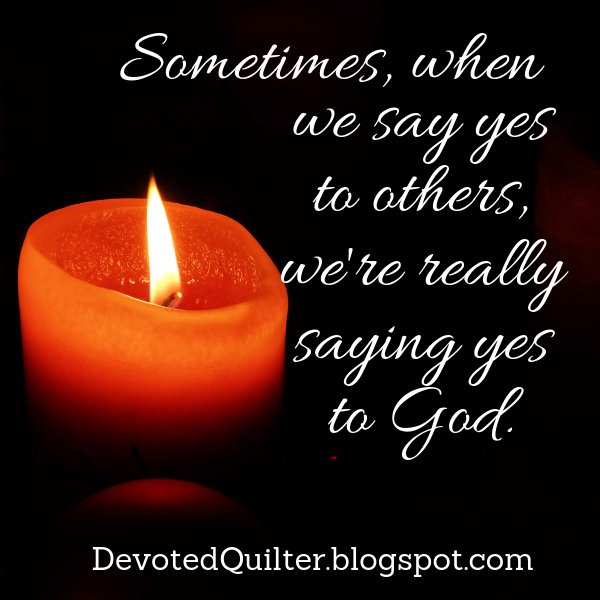 We don't know what He is doing around us, but if we are open and willing to say yes when we feel prompted to help someone or to speak words of encouragement or to offer hospitality to strangers, we may just find ourselves saying yes to God. Powerful. Guess there needs to be more Yes in the world. I had to ask myself how often I do nothing because I don't think it is enough. Thanks for this encouraging post. Good reflections, thank you! Not having the perfect solution for someone's need often makes me hesitate to say 'yes'. It's good to think what God has given us is more than 'good enough' and we can share it (skills, time, resources) not to be the perfect solution but to be part of His big plan. Giving what I DO have... That's an aspect to that story that I've never considered - thank you for pointing that out!